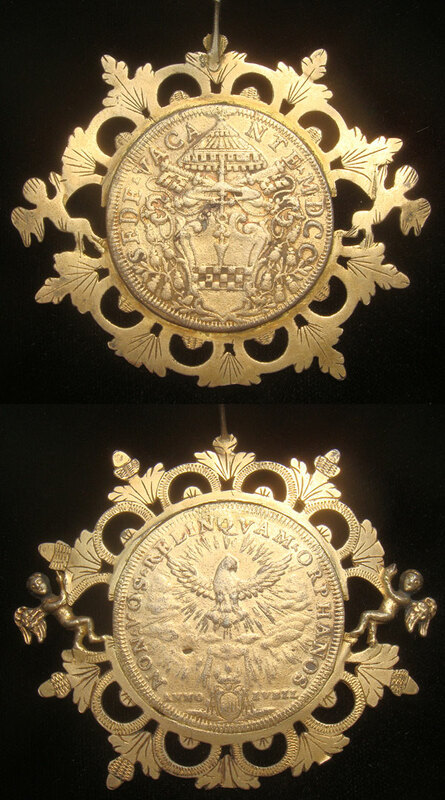 1700 Piastra Sede Vacante, gilt silver, mounted in an engraved and ornate bezel with cherubs either side, looped. Overall 85x90mm. Obverse: Coat-of-arms of Card. Camerlengo Giovanni Battista Spinola. Reverse: The Holy Spirit as radiant dove in the heavens; in exergue, ANNO IVBIL and the arms of Mons. Anguisciola. Ex-Hans Schulman Auction October, 1974, lot #888.